Gas Phase SPR allows SPR analysis to be carried out at solid-gas interfaces. Gas phase SPR capability is sensitive to biomolecular processes occurring at the solid-gas interface. 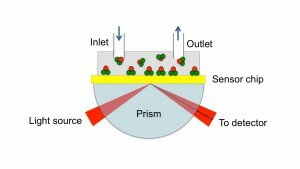 By coating a metal film with sensing materials such as polymers (Figure 1), adsorption of the molecules onto the sensing materials can be detected by observing SPR angle shift. FIG. 1 Chemical vapor or gas is delivered into a gas flow cell mounted onto a functionalized metal film. Binding of the analytes from the gas phase onto the metal film is detected as a change in the SPR angle. This technology is designed to provide users with a highly sensitive, fast and easy-to-use tool to study various molecular binding processes onto a solid surface from the gas phase. The system is equipped with a gas flow cell with fittings that are ready to connect to gas or chemical vapor sources. This helps to facilitate chemical vapor detection and gas-phase chemical sensor development.